In celebration of National Donate Life Month, MedStar St. Mary’s Hospital recently held its first flag-raising ceremony as part of The Living Legacy Foundation’s “Flags Across Maryland” initiative. The April 8 gathering honored past, present, and future organ, eye, and tissue donors, as well as donors in spirit. Organ donors, recipients, and their families joined hospital administrators, nurses, and associates at the event, which was spearheaded by hospital associates and coordinated with The Living Legacy Foundation (LLF), a nonprofit organization that facilitates organ and tissue donation for Maryland hospitals. Approximately 3,300 people are waiting on a life-saving organ in Maryland — a number that grows to 113,000 people on the national list, according to the LLF. In 2018, 159 Marylanders donated a total of 520 organs while 942 residents received a transplant. Two patients at MedStar St. Mary’s became organ donors last year, while 19 individuals donated tissue. One patient was a tissue donor in spirit, meaning the patient or family authorized a donation, but recovery was not ultimately possible. To register as an organ donor, express your wishes through the Motor Vehicle Administration or sign up on the Maryland Donor Registry at donatelifemaryland.org. 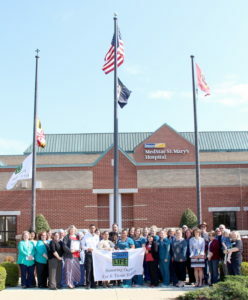 Organ donors, recipients, and their families joined MedStar St. Mary’s Hospital administration, nurses, and associates as well as representatives from The Living Legacy Foundation to celebrate National Donate Life Month with a flag-raising ceremony on April 8. This entry was posted on April 10, 2019 at 1:13 pm and is filed under All News, County, St. Mary's News, Top News, z 600X120 Top Ad Bottom, z 600X120 Top Ad Top. You can follow any responses to this entry through the RSS 2.0 feed.